You’ve got a new (or maybe not so new) Browning 1911 .380. Before you can carry it safely and comfortably, you need to find the right holster. But there are tons of holsters on the market — which one should you buy? The type of holster you need will vary depending on your habits and what you plan to carry for. Do you want to add a backup to your hunting weapons? Are you going to carry concealed? Will you be carrying in the line of duty or at your job? These are questions you’ll need to ask yourself before you purchase a holster. My personal choice for the best holster would be the Hybrid ACE-1 by Black Arch Holsters. It’s simple, but durable, and is molded to fit your Browning to ensure retention. You might be wondering about the types of holster available for your Browning. Don’t go anywhere, because we’re going to look at some of the style options available. Some offer inside the waistband (IWB) options for concealed carry. Others will position the gun outside your pants (OWB) for carry on duty or any other time when concealment isn’t necessary. And, many holsters are not ambidextrous, so you should take into account your dominant hand and whether you prefer a strong-side draw or want to cross draw. Holster styles also include shoulder and molle rigs (these are for attaching holsters to a Kevlar vest such as those worn by the military). Some may include customizable cant (carry angle), adjustable retention screws to ensure a tight fit, or retaining straps with or without thumb breaks. These holsters often come with belt clips or slots (or both) to slide the holster directly onto a belt. Keep in mind belt slots are often for standard size belts; if you wear a heavy-duty webbed nylon or leather ‘duty’ belt like police belts. You may want to check your belt’s measurements before purchasing a holster with slots and compare it to measurements in the product listing. Many OWB holsters are molded to a particular firearm or to fit a range of similar style pistols.Some slide holsters with three slots offer two cant angles depending on which slot you use. You can also get paddle-style holsters; these have a contoured paddle that slips behind your belt or into your pants. Many belt clip holsters don’t offer adjustable cant, and OWB holsters are available with or without retaining straps. These holsters are directional; make sure you order the right- or left-hand model depending on your dominant hand. 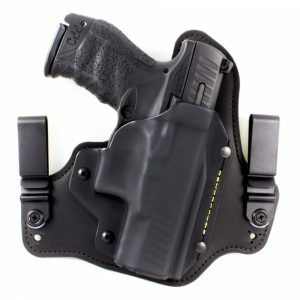 An IWB holster is intended to carry your firearm securely inside your waistband. These are usually made of leather or polymer, and have clips to hold them in place. Often they are molded to fit a specific range of pistols. Though these holsters are intended for concealed carry, some of your pistol may still show. Therefore you’ll want to ensure your clothing will hide it. Many of the polymer holsters have adjustable retention screws. However, most of these don’t allow the user to adjust the cant. These holsters come in right- or left-hand models. One disadvantage to these is they might not fit well with skinny jeans or tight pants, and may not be secure in sweatpants. There is also the consideration of what to do with your pistol while in public restrooms. These are intended to be worn so the gun rests under your off arm in a cross draw. Shoulder rigs are made of leather, nylon, or a combination of both. They are right- or left-handed draw (cross draw), so if you’re right-handed, you’ll wear the pistol under your left arm. Many have optional accessories such as spare magazine holders to balance out the weight of the harness. Some also have an additional strap to secure the bottom of the gun holder to your belt. If you’re carrying concealed, you’ll have to make sure your clothing sufficiently covers the rig. This can be done by adding a jacket or sport coat to your wardrobe. A leg holster is meant to be worn around the thigh and are often useful in tactical situations. They have adjustable straps to fit leg size, and usually have extra pockets for accessories such as extra magazines. A belt strap helps to hold the holster in place when moving around. This is, of course, not a concealed carry holster, but would work well when hunting, hiking, or engaging in other outdoor activities (if permitted in your area). Now that you know a bit more about some holsters in general, we’re going to take a look at several specific brands so you can learn more about their benefits as well as their disadvantages. This is a suede leather holster meant to be worn inside the pants. 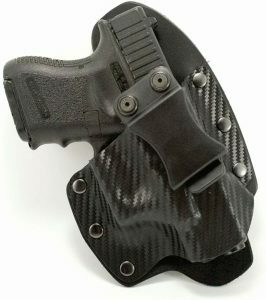 It features two clips to secure the holster to the clothing, and a curved polymer insert to help hold it closer to the body. The polymer also serves as a moisture block, which prevents sweat from soaking through the holster. Stitching between the leather and polymer is Kevlar for added strength. This holster is fully adjustable for cant (carry angle), ride (high or low), and pistol retention. The ACE-1 is a right-hand draw. 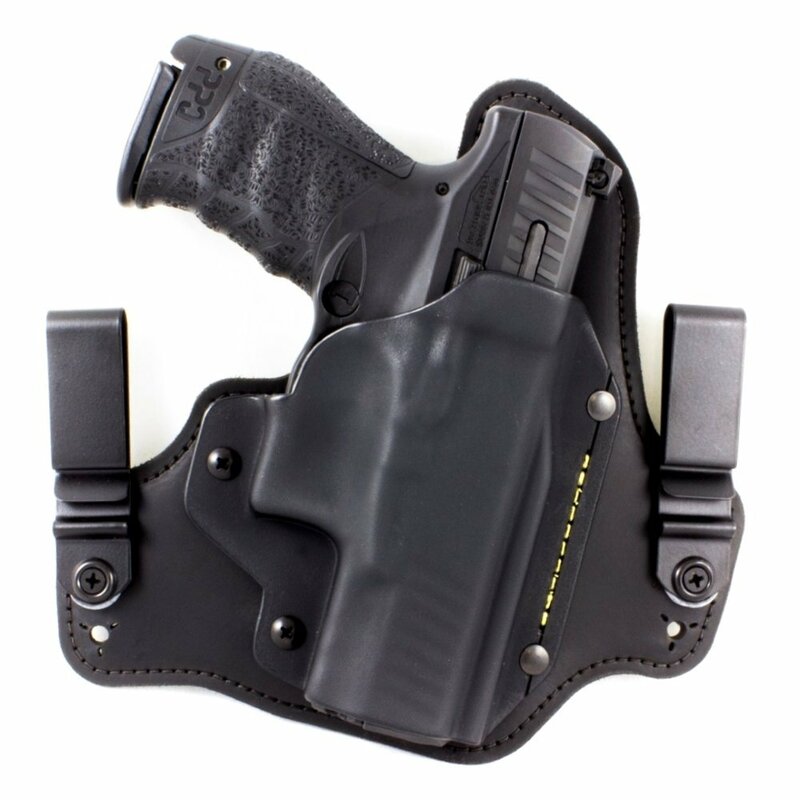 Black Arch offers a lifetime warranty on these holsters. 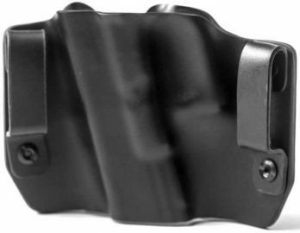 This is a molded Kydex holster with belt slides for wearing outside of the waistband. It features the Kryptek Typhon camo pattern, and is available for both right- and left-handed shooters. However, some Kydex can be abrasive, and some shooters avoid it because of the potential for scratching the pistol finish. 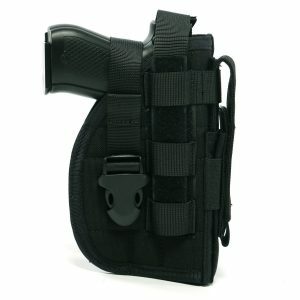 This nylon holster is designed for use with a Molle setup but is also has belt slide snaps for mounting to a regular belt. It comes in several colors and is right-handed only. The holster features waterproof nylon, however, it is open at the front of the barrel, which may allow in water or dirt contaminants. This holster is designed more for military or others in similar tactical situations. It comes with a dual-retention system, which might make it unsuitable for everyday defensive carry. This is an inside the waistband holster made with a combination of leather and Kydex polymer. The holster is molded to specific firearms to ensure a snug fit. It has a sturdy plastic clip and comes with a one-year warranty. However, there are no customizable features such as adjustable cant (carry angle) or retention adjustment. This holster is made from synthetic suede and is worn inside the waistband. It’s generic for many small frame revolvers and autos, so it doesn’t have a molded fit. 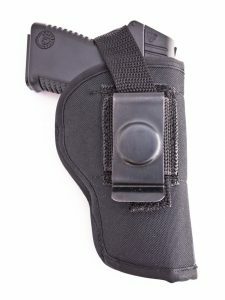 The holster does not come with a retaining strap, nor does it offer adjustable cant. It’s not specifically listed for the Browning, so if in doubt, ask the seller if it will fit your pistol before ordering. It’s right- or left-handed only. This is a nylon holster with a sturdy metal clip for IWB applications, and a belt slide on the opposite side for OWB carry. 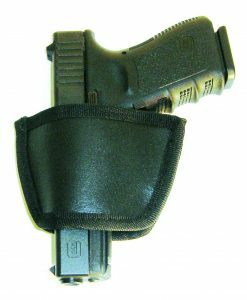 The holster comes with an adjustable retaining strap and thumb break for easy draw, and has a soft inner liner. It’s available for both right- and left-hand draw. By now you likely have a holster in mind for your Browning. My personal choice for the best holster would be the Hybrid ACE-1 by Black Arch Holsters. It’s simple, but durable, and is molded to fit your Browning to ensure retention. This is a suede leather holster meant to be worn inside the pants. It features two clips to secure the holster to the clothing, and a curved polymer insert to help hold it closer to the body. The holster has a slight curve to fit the body better than flat ones, and you can adjust the height of ride, cant, and retention to your own personal preference. A bit of high leather keeps the slide of your pistol away from your skin, preventing corrosion. It’s a little on the pricey side, but then again, so is your Browning! You’ll want something as sturdy and long-lasting as your pistol!